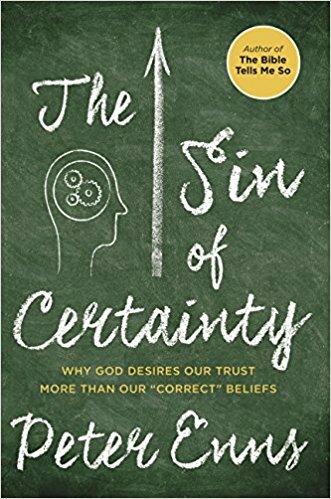 I just posted WM 90: Review: The Sin of Certainty by Peter Enns (find it here). Peter Enns, The Sin of Certainty: Why God Desires Our Trust More Than Our “Correct” Beliefs (New York: HarperCollins, 2016): 230 pp. 1. The problem of inerrancy as a theological concept to the define the nature and authority of Scripture. Many modern evangelicals have either stretched the term “inerrancy” so broadly or twisted it so perversely that it hardly means what earlier men meant by it. 2. The dangers of the desire for academic respectability. 3. The problem of epistemology. Enns elevates uncertainty, doubt, and mysticism, rather than certainty, faith, and reason. I hear the same sentiments expressed in Biblical studies by those who want a canon of books but not canonical texts, who want Bibles with multiple suggested variants but no certain text. Is the quest for certainty necessarily sinful? We can never properly understand the Bible until we accept the biblical narrative as it presents itself to us. And in order to do so we must use the closed, fixed, canonical, confessional text.